I can envision those sunken logs now. They're licking their lips in anticipation of tasting your newly expanded selection. i can't wait to give them a couple of my finest. logs need food too. If you need to find a new home for any of them, I'll be glad to give you my mailing address. I like the looks of those. Sure look fishy. Nice work. 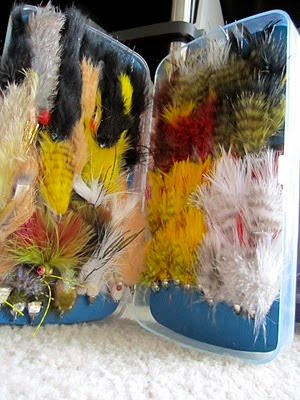 @ Jay - If my second streamer box overflows with fur and feathers, i'll let you know. @ Ben - all credit goes to George Kesel. I probably couldnt tie a san juan worm. Thanks Dustin. appreciate the follow.